Use a visual representation of the grade distribution list like a pie chart. Use images of key authors, required textbooks, or course management system logos such as Canvas or Blackboard. Use images to depict main concepts for class alongside a course description. Use word clouds for lists of key terms, generated by websites such as wordle. The following before and after images illustrate one instructor’s move from a traditional text based syllabus to a more accessible image driven syllabus. The syllabus on the left shows dense text and undersized margins. The page contains the course information, required texts, course description, and grade distribution. There are bulleted lists, but the text covers almost every inch of the page. In the newer version, the information is organized in discernible chunks. At the top, a course banner contains a collage hinting at the rhetoric the course covers: famous politicians, including Martin Luther King Jr. and Hillary Clinton; American slogans from “Power to the People” to “Just do It;” and iconic images from Uncle Sam to the Microsoft logo. Beneath the banner reads the course title, First Year Writing: Rhetoric and Research in the Digital Era. 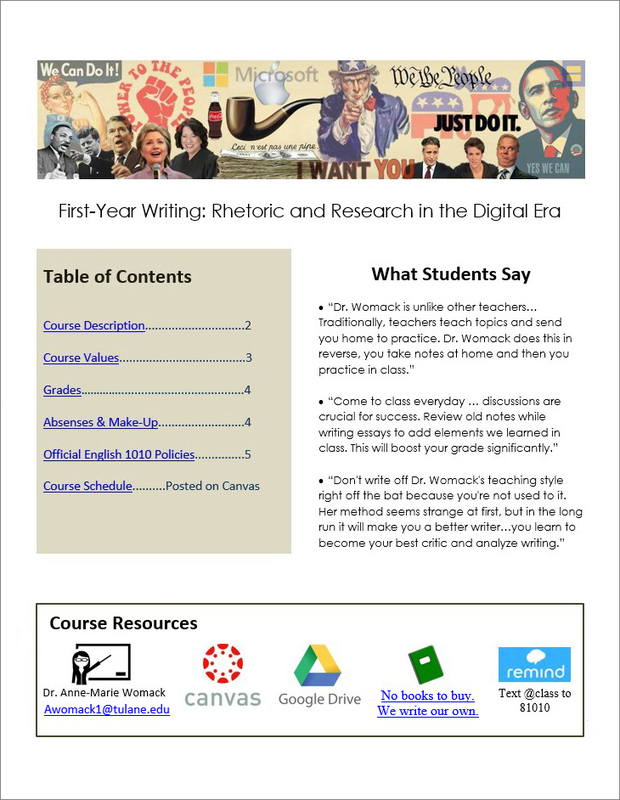 Below on the left, a table of contents offers hyperlinks to the syllabus components, such as course description, grades, and official policies. On the right, three student quotes about the course provide a quick idea of the class structure. Blocked together at the bottom, hyperlinked images show essential course resources: a teacher icon with the instructor’s name and email address, a Canvas learning management system icon, a Google Drive icon, a notebook icon that takes students to a prompt to create their own textbook, and the Remind logo for a class text message system. The new version strives to provide redundancy across modes: images for visual learners; alt text for auditory learners; and digestible sections for learners with reading disabilities. What is not visible on the syllabus image above is a hidden hyperlink in a font color matching the background. At the top of the page, it reads “Text only version of syllabus” and hyperlinks to a version more legible to screen readers. Many of the features that improved visual design here (such as text boxes) created difficulties for the Microsoft narrator we used to test the page. Narrator is described more in Microsoft’s Accessibility Guide for Educators. That doesn’t mean though that images or organizational tools such as bullet points do not convey useful information to people relying on text. 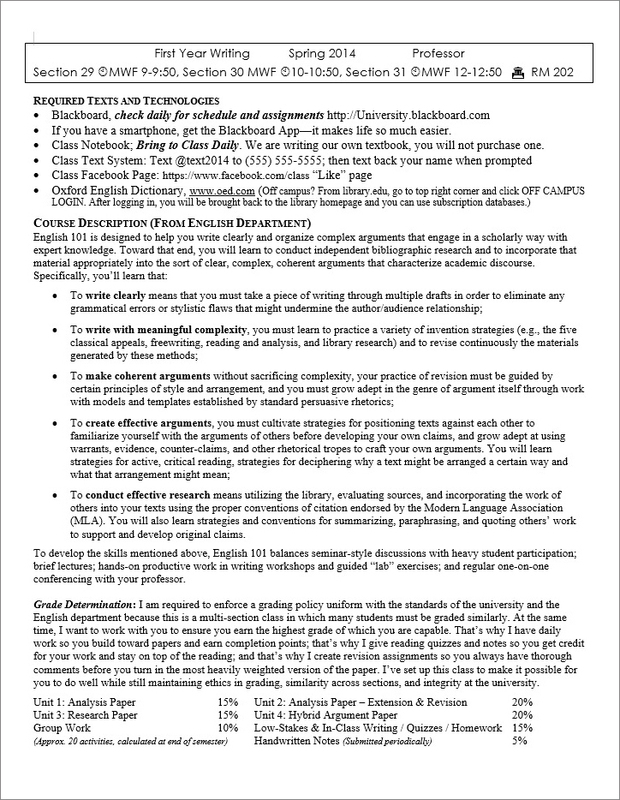 The text-only syllabus still includes alternative text for images, but instead of embedding it in an image, it lists it in the main text and doesn’t include the image. Why is the image there? If there is no description what will the readers miss? This third question, Gould points out, does not imply that alt text should include every visual detail, but rather that it should include the most important concepts. Don’t enter “photograph” or “picture of.” Screen readers already note the presence of an image. Move from general description to specifics to allow readers to choose whether to go further and deeper in the same way a visual reader does. Keep text as concise as possible based on the rhetorical situation. Many online sources recommend between 5-15 words, but this number is not an absolute. All of the alt text examples below use over 20 words to make room for crucial historical details. Ask someone who has not seen the image to review the alt text. The alt text examples in this section come from national news sources. The descriptions demonstrate how important it is to know the context of the image as well as the people, events, and objects it depicts. Using hydrotechnics and mist-based holographic projections, a 40-foot hologram of Carmelo Anthony was created in the Hudson River.CNN. The twitter Alt Text Bot can help with crafting alt text. First, register at their site alttextbot.com; then tweet an image and mention @alt_text_bot. The bot will reply with an alt text description, which you can amend to convey essential information not detected by the bot. The images below demonstrate both the strengths and drawbacks of the bot. The first image is the same famous VJ day kiss image cited above, but the bot describes just a couple kissing. The Times lengthier description gave more necessary context so readers could understand the photo within its historical moment. The second image below seems busy and complex, which could present challenges when creating alt text. It features a silhouette of a head being encircled by 50 small objects including a computer, arrow, house, and star. In the middle of the circle is the word kNOWledge. The bot, though, does a good job of boiling it down to its essential meaning, a depiction of knowledge. If alt text is ever left blank, a screen reader will notify the student that an image is present but has no description. This omission excludes readers from the document. Sometimes with purely decorative images, though, like a flourished line between text sections, as shown below, alternative text may seem unnecessary. Don’t use null alt text if the image is the only thing identifying a link, otherwise a user will not be able to navigate to the link. If an image is described in a caption, use “refer to caption” as alt text instead of null. Images often introduce color, a format not legible to all readers. Kei Ito and Masataka Okabe provide helpful guidelines for universal color design online, in which they discuss common types of color blindness that affect red, green, and blue color perception. Like all disabilities, colorblindness affects individuals uniquely, but the following guidelines can help make colors more accessible. Information should never be conveyed through color alone. Create contrast not only in color hue, but in brightness. Avoid layering black on dark red, which can appear as black on black. If you use laser pointers in class, choose green, which is more widely accessible according to Masataka and Ito. Consider the two contrasting images as an example of applying the principles of universal color design. Both visuals present assignments and their grade worth in pie chart form. Each uses differently color coded pie slices. But on the left, the less accessible pie chart lists a separate color coded key to the side that designates which slice goes with which assignment. It layers black text on dark chart colors. In contrast, the sample on the right labels the assignments within the slices and uses white text on dark background colors. Moreover, each slice is outlined by a darker version of the hue–the blue slice is outlined by a dark blue line, for example. So contrast, not simply color divides the sections, which can prevent them from blurring together. Image-driven syllabi, when accessible in multiple modes, can create an engaging tone for the course.